If you enjoy designing really creative digital work, then this bundle is made for you. We’ve sourced all of the best artistic design resources in the world, and put them together in one truly inspiring bundle. There’s a ton of variety in this bundle, and these resources are not only lots of fun to use, but they’ll save you hours of time and stress! Give your designs beautiful artistic effects easily, and show them off in style! Before we dive into today’s bundle goodness, we wanted to wish you happy new year from the entire Design Cuts team! Following an incredible 2014, we wanted to start off your new year with a burst of creativity. You may have seen that we were speaking with you guys a LOT over the holiday break. Between personally reading thousands of survey responses, chatting with many of you on Skype, and discussing how we can serve you guys better on Facebook and Twitter, it’s been pretty eye opening! You see, we don’t want to guess which resources will help you the most, we want to be 100% sure that our bundles will be incredibly valuable to your design work. 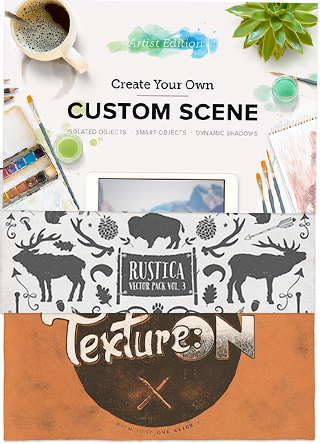 So many Design Cutters were requesting themed bundles, particularly those featuring artistic resources that lift the creative impact of your design work. The great thing about these resources is that they’re the ultimate shortcut for creating really impressive outcomes. We don’t all have endless hours to spend on sourcing and scanning materials, transposing them to digital format and tweaking/perfecting them. With the items in this bundle, you’ll be getting access to some of the best creative sets in the world. These resources allow you to create everything from water-colour effects, to wintery graphics, photo manipulations and retro print designs in a matter of seconds, rather than days. Oh, and best of all, you can get all these gorgeous artistic items for a massive 93% off the regular price. These are best-selling items, and so this kind of discount took some serious negotiating for the DC community. Of course we’ve also included our famous extended license on all items. 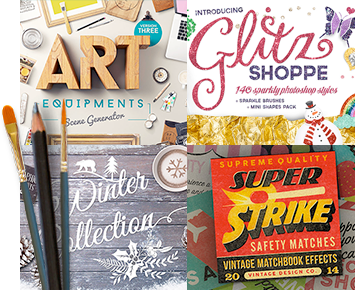 There is a terrific variety of creative goodies in this bundle. We wanted this collection to help you with all kinds of design projects. It includes watercolour effects, retro effects, gold effects, glitter effects, an awesome font, vectors, photo manipulation effects, some hugely popular mockup templates, artistic scene creators, photos, filters/presets, winter graphics, wood effects and more! Phew! There really is a ton of value in this bundle. Not only do these items allow you to create gorgeous artistic effects in your design work, but the range of mockups and presentation templates allow you to show it off beautifully – be it through a digital device mockup, poster or picture frame. All of the items in this collection are best sellers, and for good reason! To be sure of the quality, we’ve spent the past 2 weeks working with these resources, to get a feel for the flexibility and benefits of each one. I can personally say that I’ve never had so much fun working with Design Cuts resources! There are just endless uses for these artistic resources, and they’re such a pleasure to use. The biggest benefit of this collection is the time that it will save you. Over my years as a designer, I’ve wasted so many days trying to nail the perfect watercolour effect, or gold effect and eventually given up frustrated, as I’m my own worst critic. These resources will save you countless hours and stress, and allow you to create beautiful outcomes in seconds. Beyond this, they aren’t a one outcome solution – you can always go in and customise/tweak these effects to your hearts content. The customisation options and flexibility of these packs is staggering. Of course this wouldn’t be a Design Cuts deal without extended licensing (meaning you can use these items in work you resell), and full web font versions for all fonts included. Most of these best-selling resources don’t have an extended license available anywhere else, making this license is hugely valuable. Also you can convert your design into watercolor. You will get a “Watercolor Generator” with this file and get realistic watercolor effect with just pasting into smart object. *And “Hand Sketched” with new update. This file includes over 80 items, all of them grouped and layered very well, so you can drag&drop any items into “Scene Generator” and move and rotate them as you want. *With new update over 90 items. And also this Scene Generator includes 9 high resolution ground textures. You can put your items on to any textured ground. *15 textures with new update. This Photoshop file lets you to convert your 2d content into 3d. You will get clean and realistic 3d render results. No need any 3d software or knowledge. Just paste your content into smart object and save it. You can create unlimited variations. Everything layered and well organized. Change background color, play with reflections, play with global lights to get amazing side reflections. Also fillet feature can be change. You can bevel your content 7 different value. There is a light setup and vignette effect to make your work looks better. Present your work better or use 3d text in your awesome works. You have no limit to create unique compositions with this mock up. From the 1920s to the 1950s, a small but useful advertising gimmick spread like wildfire into the purses, pockets, and kitchen drawers of millions of Americans. The give-away matchbook was one of the most pervasive means ever found of putting promotional images into the hands of the public. Super Strike recreates those wonderful works of art instantly. It takes your flat, dull illustration and adds unique and realistic textures, filters and even offsets the black from the colors, for realistic miss-registration effects. This is done automatically all inside the SuperStrike PSD. No splitting your artwork into different smart object layers. Just one place to paste your work and it’s done. We’ve included a video to show you how it’s done in the product folder. • 14 Bespoke retro illustrations in Illustrator AI format. Includes visual PDF list of all fonts used. For use in all commercial and personal work. Get seriously cool double exposure effects with ExposureX2. Doing a quick Google image search on double exposure brings up some amazing creations but to achieve effects like this requires quite a long process. So that’s why I’ve made a smart PSD which lets you do it just a few clicks. This Photoshop document requires just a basic knowledge of layer masks using the eraser tool and that’s it! We’ll have a tutorial video for you in the the product folder. • 150 hand drawn vector graphic elements(preview 2). Oodles of blingy textures in a RAINBOW of colours , to suit any project! Glitzy Golds, Silvers, Blues, Pinks, Reds, Greens, Purples… And just incase you can’t find the shade you are looking for , I’ve included a quick easy guide on how to create your own unique colour in seconds! Bling up any design, and turn it into something special in the click of a button. And to add to all this sparkly madness , I’ve included a few bonus extras to sweeten up your designs! to bring it to life! 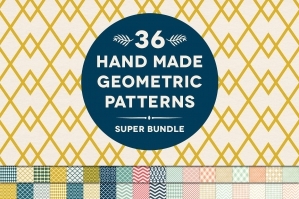 • A pack of scaleable photoshop shapes to kick off your creativity! • A Xmassy bonus of the Printable Santa’s Belt Greeting Card in psd format. • A Handy Colourchart Jpeg for you to find the sparkle you are looking for. • A mini Tutorial on how to make your own uniquely coloured sparkly style. • A mini guide on how to load up the styles and use them in photoshop. The High resolution Sparkle textures are high quality, so the files sizes are large. The complete file size exceeds that of Creative Markets upload limit, so for that reason , and to make it easier for you to download, I have split the pack into 3 smaller more manageable packs for you download at your leisure. Create your stationery or header mock up. So you save money as you can do two different types of mock up with the same files. Lot of items have multiple positions for a better realism. These files are in high resolution, so that you can make little or big scene. A stationery mock up with high details. All objects are in the air. Further, each object is separated and movable so you can customize it as you want. A stationery mock up with more than 24 objects. This file uses axonometric view so that you can move all objects as you wish. Futhermore, you can add any object on another one. Some objects have several variants, see the objects included below for more details. Create your own scene! – in seconds. A great way for any creative person to show off their work. In this psd you can create your own fully customizable desk environment where you can display your own, or your clients work. Add as many poster frames as you like, move them around, change their frame surface and much more. Display your own work, your clients work or maybe just your upcoming ideas for a new poster. Perfect for Dribbble or Behance previews or to show your clients work in. In this Mockup Pre Creator, you get full control of the desk, the desk items you see in the preview, and all the frames either hanging on the wall, or standing on the desk. You can resize the desk, change the desk surface and even change the desk legs. All items have been cleaned up, hand traced with pen tool, and layered in a very nice order. All shadows are in separate layers. Every frame has 2 types of shadow. One for standing on the desk, and one for hanging on the wall. We’ve also included a document for you containing a full content list, as well as loads of video tutorials. The FilterGrade 220 Photoshop Actions Bundle is our best product yet. Included are all 11 series of our Photoshop actions. Ranging from our Retro Series all the way to the Photo Retouch series, you get everything. Save hours using some of the most advanced Photoshop actions on the web to edit, adjust, and enhance your photos. 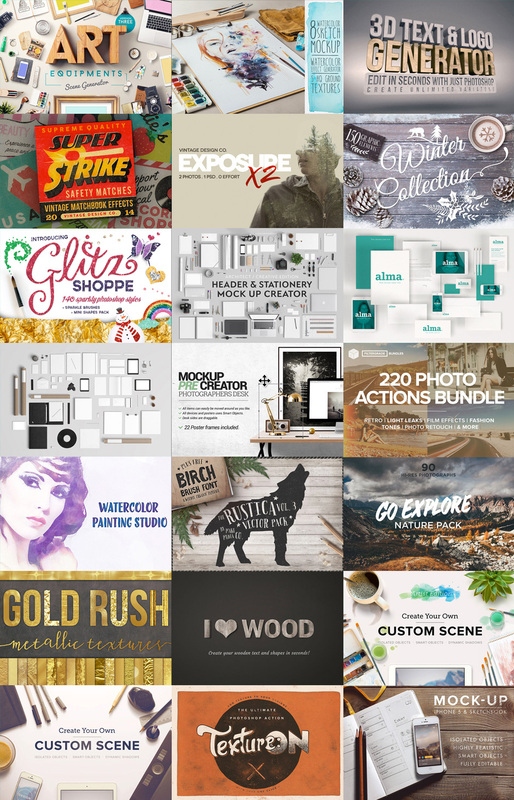 • 220 Amazing Photoshop Actions. • Retro Effects, Light Leak Effects, Film & Cinematic Effects, Chill & Subtle Effects, Light & Seasonal Effects, Black & White Effects, Fashion & Blush Effects, and Photo Retouching Tools. • Help Files, Full Tutorials, and More. I’m happy to present the third part of one of my best-sellers: “Watercolor Painting Studio”. This psd template will help you to convert your photos to awesome watercolor artworks just by few clicks. Unlimited number of end effects and no skills required! • 7 unique handcrafted watercolor textures. • 15 handcrafted watercolor brushes. • 15 handcrafted acrylic brushes. Attention: This template will NOT work in Elements, Gimp or any other program! Tested only with Photoshop CS 5/ CC. Use the elements & font to compliment rustic wedding invitations, save the date cards, apparel, logos, typography and more! Included in the .zip are an AI and EPS file, as well as a single .PNG file, and an OTF of the Birch Brush typeface. The elements can be opened in Adobe Illustrator CS or newer (and comparable vector software). Awesome Ultra hi-res 90 nature photographs from Iceland and Europe. • Any other promotional or presentational works. All images are at least 5000 px (typically 5472 x 3648 px 72 ppi) and were processed in Lightroom. This collection was essentially born of necessity. I was seeing “gold foil” designs all over the web which I loved, BUT it looked like they all came from the exact same texture. So, I set out to make a collection of every texture imaginable, all in glorious, shimmering gold bling! I have been using these textures extensively on my own projects for months but now I am happy to make them available to you in this handy bundle. These textures are as versatile as they are unique. Just pick a texture, use a clipping mask with your design, text or shape, and viola! Beautiful and modern gold foil designs. Or, use them as a background for photography, cards, web design, or endless other projects. Professionally looking and incredibly easy-to-use PSD file that will make your texts and artworks look like they are made of wood. All you have to do is to put your text, shapes or logos into the Smart Object and that’s it. You have a choice of 4 different high quality wood textures. The file has resolution of 3000×2000 pixels which guaranties the highest level of detail. Using Photoshop’s technology, each object is a smart-object, allowing you to transform each object non-destructively. Would it make sense if the shadow remained the same while moving and rotating an object? Of course not! Dynamic shadows will do the job! Using Photoshop’s Global Light, each object has it’s individual shadow that will change direction depending on it’s own rotation. Also because this composition is using Global Lighting, it’s easy to change the direction of the light of the whole composition! All Custom Scenes include 10 filter effects to create unique composition and a lighting correction layer to improve your lighting scene. It also includes a background layer to easily change your backgrounds. This set now also includes a rasterised version. A rasterised version is a smaller resolution (2400×1600 @ 72ppi), all smart-objects has been rasterised. This way, it will help you to work faster on the files and it works perfect for your blog, portfolio, Pinterest, etc. Notice: Because this PSD includes several layers and works at 6000×3000 at 300ppi, in some machines, editing could go very slowly. I recommend to hide unnecessary layers and then work with the scene. and always keeping the original layer. • Works with multiple layer composition. Perfect for Illustrations! • No PSD mockup required, it works on every format file! • Presets: use your most common actions in just one-click! Mock-up with iPhone 5, Sketchbook and Copy Text made of real photographs. This PSD includes isolated objects (iPhone & Pencils) to create unique compositions. It allows you to hide or duplicate objects, like having multiple iPhones! The sketchbook is also editable with left and right page. In each page a dot-grid layer is included, perfect for your wire-frames and technical drawings! Really, this mock-up won’t limit your creativity for your presentations. It’s perfect for your sketches, wire-frames, designs, artwork and more! This bundle includes thousands of artistic resources, including watercolour effects, retro effects, gold effects, glitter effects, an awesome font, vectors, photo manipulation effects, some hugely popular mockup templates, artistic scene creators, photos, filters/presets, winter graphics, wood effects and more! File size is approx 13GB (split into 19 parts) for easier download. A pdf guide has also been provided. Great deal, i’m loving it! Hey! I purchased this when it was out and really need the “women’s arms” that have been added the Art Generator pack. I noticed that in the Market place here that they have this specific package with the new women’s arms in it!! 🙂 Is there anyway for me to JUST get the arms?? Otherwise the pack is the same. I work with all women, and could really use them. Thanks! https://www.designcuts.com/product/art-equipment-scene-generator-v4/ You can see they have a big thing saying Women’s Hands added! 🙂 I know they had a big demand for them. Thank you! I would love to buy this! Will it be available again anytime soon? Thanks so much for reaching out. I really wish I could help you out with this one but unfortunately this bundle is no longer available. The good news is though that you may be able to grab some of the items from this bundle in our recently launched marketplace! Our marketplace gives you the option to grab some of the most popular products from past bundles as a kind of second chance if you missed them the first time around. Thanks for the comment on this one! I am afraid that this bundle is one of our older bundles and is no longer available! Just in case you hadn’t seen it on our website, we are launching our own marketplace today! Our marketplace will allow you to grab some of the most popular products from past bundles as a kind of second chance if you missed them the first time around so if there was any item in particular from this bundle you were after, you may be able to get it in the marketplace. We will officially launch it later today, Thursday 18th Feb and we have loads of fun things planned including some really cool competitions so please do get involved :). Any possible way how to get this amazing bundle at this moment? Or could I at least be notified when it is available again? Thanks. Thanks for the comment on this one :). Unfortunately this is one of our older bundles so I am unable to get you set up with this one. However I have popped you on the master list so rest assured, if this goes live again, I will definitely be in touch :). Bought this ages ago, but am just now trying to use the TextureOn product and not understanding how. It says to use three actions, but where/when? Hope someone can still help – thanks! This is a wonderful bundle! Thanks for the comment and my sincere apologies for the delay in getting back to you on this! Rest assured we can help get you working with Texture On. I have sent you an email to get a little bit more information on this. Please bring the deal back it looks amazing! If it does return could I please be notified through email! Thanks so much for your comment on this one- we are so pleased that you like the look of this one. No words… lot more than I expected!!! You are very welcome! I really hope you’re enjoying your new resources and will get loads of use out of them. If you have any queries, please let me know. I am always happy to help! Thanks for commenting and we are so happy to be able to help you with this one! This bundle is truly gorgeous and I hope you love working with it! Please do feel free to share anything you create with your new resources as we would love to see that you are working on! hey, again, like many, am seeing this well too late. Will it be available in the near future, its stunning!! Thanks so much for commenting on this one! The Gorgeous Artistic Design bundle has been one of our most popular bundles this year- i am so sorry that you missed out on this one. I have popped you onto the master list for this one Mark and rest assured, if it goes live, i shall definitely be in touch :). Oh NO!! I missed it! How to grab this bundle now? I am really sorry but I’m afraid that the Gorgeous, Artistic Design Bundle. deal is now well and truly finished, so I won’t be able to set you up with this. However, sometimes we do re-run an older deal as a special bonus, in conjunction with a new deal. The best way to ensure that you don’t miss a deal is to join our free newsletter, by signing up at http://www.designcuts.com. Oh, Nooooooo! I missed the deallll! I need it so bad! Please let me know when this offer will be available again! Thanks so much for commenting on this one. I am so sorry that you missed out on this one but I’m afraid that The Gorgeous Artistic Design deal is now well and truly finished, so I won’t be able to set you up with this. However, sometimes we do re-run an older deal as a special bonus, in conjunction with a new deal. The best way to ensure that you don’t miss a deal is to join our free newsletter, by signing up at http://www.designcuts.com. Thank you so much for your comment, I apologise for the delay in getting back to you! The Gorgeous Artistic Design Bundle is now available as part of our birthday celebrations, I hope you were able to pick it up! Please don’t hesitate to contact me should you have any other questions. I’m always happy to help! Thank you for your comment on this bundle! I am so sorry that you have missed out on this one- we actually had this as a re- run not too long ago so i am sorry that you missed out on this one. It is still really popular and we get a lot of requests for it to be re- run again so it is a definite possibility that it could be featured in the future! I have added you to the master list Alejandro and will send you an email if this one does go live again. I hope this helps, and please don’t hesitate to contact me should you have any other questions. I am so sorry to hear you missed out on this bundle! I would love to keep you updated should it ever become available again 🙂 I’ve sent you an email to help with this. Holy Moly!! This package is beyond believe!! How can I get this awesome package?? Sometimes I find these gems on Pinterest when searching for a specific project. I think it’s sooo unhandy that this awesome packages are available for only a curtain time 🙁 I understand that this is the whole concept and business model, but I really like some of the old deals. Can you please, with whipped cream on top, let me know when this package is available again for me??? Thanks so much!! Love you guys & keep creating these awesome deals! Thank you so much for getting in touch with your kind words! I am so sorry that you missed out on this one. is it possible to still get this? Hey Vivian, thanks so much for getting in touch! I’m really sorry you missed this bundle. I would love to keep you updated on if it ever became available again 🙂 I’ve sent you a quick email that should help! What is the name of textureOn? i cant find it in the list of download. Could i link this products with creative market to keep updated the products (like the games with Steam)? Thanks so much for commenting! I can certainly help you with this! TextureON is located in your Roman Jusdado folder. I have also popped you over an email about linking your bundles which should help! Please do let me know though if you have any other questions Nammu, I am always happy to help! How can I buy them ? Thanks so much for contacting us about this. I’m afraid that the Gorgeous Artistic Design Bundle deal is now well and truly finished, so I won’t be able to set you up with this. However, sometimes we do re-run an older deal as a special bonus, in conjunction with a new deal. The best way to ensure that you don’t miss a deal is to join our free newsletter, by signing up at http://www.designcuts.com. Thanks for the comment! I’m afraid that this deal is now well and truly finished, so I won’t be able to set you up with this. I have added you to the master list and I’ll be sure to drop you an email if this bundle goes live again. I have you on the list for this one as well! Hello! I don’t know how I missed this one – could I pretty please be added to the list as well? What are you doing, guys? I can’t stop buying all your deals. All money for shoes and bags now I spend for that, aaww))) Many thanks!!! You are the best! Thanks so much for the awesome comment! You are extremely welcome! Wow that is true love for Design Cuts right there if you are giving up new shoes and bags for our bundles :). We think you are the best for your support! So glad you brought this deal back as a bonus with the new Beautiful Artistic Designers Kit deal. Do you have a complete download link? I am really sorry but I am unable to set you up with this deal but it has expired. However, sometimes we do re-run an older deal as a special bonus, in conjunction with a new deal. The best way to ensure that you don’t miss a deal is to join our free newsletter, by signing up at https://www.designcuts.com. Those watercolor textures look truly amazing 🙂 how could i purchase these bundle now? The purchase button seems no longer available. I have added you to the master list and I’ll be sure to send you an email if this bundle is live again. Please let me know if this deal is ever available again. Thank you! I’m afraid that this deal is now well and truly finished, so I won’t be able to set you up with this. However, sometimes we do re-run an older deal as a special bonus, in conjunction with a new deal. I have added you to the master list for this deal so if the bundle goes live again I’ll be sure to drop you an email :). could I also be added to the list?? omg this bundle is amazing!! Please add me to the list as well. Thank you! Consider it done :). I have added you to the list for this deal and if it goes live again, I will send you an email! Your wish is my command :). I have added you to the list and will send you an email if this goes live again! Carol, Thank you so much for the follow up! Excited this bundle can back around and have just purchased. Again, that you for the great customer service and follow up. Thanks so much for coming back to me! I am so pleased to hear you are happy about the bundle re-run! I do love sending the follow up emails :). Let me know if this bundle comes back! I really need this! Thanks for commenting. I have added you to the master list for this deal and will definitely send you an email if it goes live again! Yes- this one is finally back! I have a feeling there is going to be some very happy community members! Please let me know if this deal is ever available again. I have added you to the master list for this bundle. If it goes live again, rest assured I will pop you an email :). Can you please add me to your list of emails? I really appreciated this bundle and I’m waiting for it! Thanks for the comment and i have added you to the master list. If this bundle comes around again, I shall pop you an email! Can you do that for me to please? I really want tis bundle!!! Not a problem- consider it done! If it comes around again, I will send you an email to let you know :). I have added you to our master list for this bundle so fear not, if it is released I shall send you a personal email. Hopefully that will ease the hunger pangs for you :). tutorial ExposureX2 – Advanced Photo Effects incomplete ? I am sorry to hear you are having trouble- I have sent you an email to try and help you out with this :). is this deal running again i 100% will purchase it if so!!! very cool! Thanks for your comment. We are really grateful for you taking the time to give us such amazing feedback :). This deal should re- run in the not so distant future. I will add you to the list and email you as soon as it is coming back. I hope that helps but let me know if you have any other questions! I have added you to the list too and I will email you as soon as it comes live again :). If you have any queries in the meantime, please let me know. Excellent job… as usual. Thanks, DC team! u guyz very good job plz i need this pack…. I’m so sorry, but this deal now well and truly finished, so I won’t be able to set you up with this. I’m sure we’ll re-run this quite soon though, so I’ll be sure to drop you an email as soon as this bundle is live again. Can you send me an e-mail when this bundle is available again? or is there a way I can purchase this bundle now? Thanks so much! Of course I can, no problem at all. Can you please email me if this bundle ever goes live again? I know that sometimes you reoffer them for a short time. Thank you so much. Absolutely, not to worry, Amanda. 🙂 You can expect an email from me as soon as this bundle is available again. Oh me too please and thank you! No problem Heather. I’ll be sure to email you as soon as the bundle is live again. Absolutely Vivianne, I’ve just dropped you an email about this :). I’ve just come across this deal today and am DYING for it. After seeing the quality of the bundle I just purchased I know this is a must have. Any chance of a redux? I’m desperate. I’m so sorry Jasmine, but this deal has now well and truly expired. Rest assured that we will almost certainly re-run this bundle though, and I’ll be sure to email you once it is live again. I’m so sorry I missed out on this deal. Is there any chance you will offer it again? I’m sure we’ll offer this bundle again soon. It’s only had its original run so far, so we should be offering this again within the next few months. I’ll be sure to email you once this bundle is live again. I know I missed this deal but I would also like to purchase this pack. Is there any chance? I’m so sorry Timy, but this deal has not well and truly expired, so I won’t be able to set you up with this at the moment. But rest assured that I’ll email you as soon as this bundle goes live again. No problem at all. Me too! Email me too! 🙂 I cannot believe I missed this. What a bundle! No problem at al, Noelle. I’ll be sure to add you to my snazzy little document and email you as soon as this bundle is available again. I want this! How do I get it? So many lovely play things! I’m afraid this deal has now unfortunately expired, so I won’t be able to set you up with this, at the moment. I’ll be sure to email you though, as soon as this bundle is live again. I just came across you guys yesterday and purchased the amazing fonts bundle. Now I’m discovering all this goodness and can’t hardly believe it is for real! Totally blown away by the gorgeousness of all those bundles! Great work! I know I missed this deal, but any chance you’re still selling the pack, or even at a higher price than the deal? These look amazing, and I’d love to purchase the pack. Thanks! Hi, Can u please make the deal available for me? Thnx! I have just emailed you Rathish. This bundle looks awesome! It is sad to see that it is expired. Will you have this deal back again? Let me just drop you an email, Jocelyn. Hi guys 🙂 I’m just wondering if the mockup pre creator (place.to) from this bundle is the same version as from the video description, couse I can’t finde some options ( plants, accesiories, wall types etc.) in my file. Thanks. The version included in this bundle is actually just a small part taken from the full version, which is the one used in the video. That’s probably why some of the options are missing. If you’re struggling with anything in particular, please don’t hesitate to let me know, and I’ll be sure to help you out. Not to worry, David. I just sent an email to you. Will you be realising this deal again? I tried to purchase it on the 20th but it said the deal had already expired. Ohh noooo can it be, I missed the deal /o\ is there a way to get it?? No worries, Jaz. I have email you about this. Hi, I’ve only just come across this bundle now, will it be available to purchase again in the near future? I know what you mean, Steve. Let me email you about this now. Wow I can’t believe I missed this!! Is there anyway I can get it? Let me drop you an email Jason. I just dropped you an email about this. Just discovered your site yesterday and I am so happy I did – love it. I am however beyond disappointed that I missed out on this bundle. Is there any chance you’ll do this bundle again in the future? Welcome to the community, Brandi! Let me just email you about this. Please let me know when you will be offering this deal again? You have a few essentials I really need to add to my tool box. Thank you. I also missed it… Amazing work !!! Let me email you about this, Sidonie. Wow, I’m so devastated that I missed this bundle! I was so behind on work after the holidays that I just didn’t have the time to check it out until now…and I’m too late…am I too late or do you have some secret portal for late-to-the-party designers, who desperately need it? Hehe Secret portal. 😀 Let me check if any bundles are still hiding in Narnia, and get back to you. Not to worry, Sarah. Let me email you now. Missed the deal 🙁 is there any other way to get it? I’ve sent you an email about this, Josh. UGH, I just got back from shooting some video for work and it looks like I missed this! Will it be back anytime soon? I’m trying to finish my website, and this was my ticket to finishing it and being happy with it — FINALLY! Let me drop you an email, Lindsay. 🙂 I hope you had fun at your video shoot. Oh no, I thought I had time for this deal but I missed it 🙁 Looked like a great set. I’m so sorry to hear you missed this. Let me drop you an email now, Jean-Sebastien. How sad! I missed this. Any chance to purchase this deal? I really want it so much. Let me see what I can do for you Anthony. I’ll email you now. Hey i know I’m a bit late to the game but is there anyway i can get this expired bundle? I told myself I was going to save money this month, but I keep coming back to look at this deal, and now I really regret missing out on it! I missed it! I would love an encore of this deal. Let me email you about this, Alex. Any chance I can still get this bundle? It wasn’t in my budget last month and I would be able to get it in February, I really wanted to get it, you put out the best stuff. Let me email you about this. Don’t need anything out of it right now, but I know I would have bitterly regretted it if I didn’t buy it! Great pack. Now I just need to find the time to play with all these resources! That’s always the problem, isn’t it. I have to admit I never have as much time as I;d like to, to play with all these pretty design goodies. I’ve bought this fantastic package, but unfortunately the downloads are too big for my slow internet. I’ve been trying to download the first file (2 GB) but when I get to about 500 MB my connection times out every time. Where I live in Australia a 2GB file takes me one and a half to two hours to download. My average download speed (on a good day) is only somewhere between 200 – 300 KB/sec. It’s looking like I won’t be able to download the larger files. I’m so sorry to hear you’re having trouble with the downloads. Let me email you about this, and we’ll get the downloads all working for you. Alrighty.. since everything is so 100% perfect and that just can’t be really real all the time right? Too good to be true sort of mistrust could evolve.. you know! Could we ladies, receive some mock up lady arms.. (almost wrote lady fingers) … you know.. just like, I can’t pretend to have those men arms on my workspace… 🙂 Perhaps just as an add on/ freebie of some sort? This will be my FIFTEENTH bundle.. someone save me! Wow, 15 bundles! That’s incredible! Have you created anything with your resources yet? I;d love to see how you’ve used them. It should theoretically work, once you’ve installed the resources to your computer, as you’d just load them to their system. However, I also know that some people had trouble with this in the past, so it’s worth double checking this with Pic Monkey. Okay guys, you got me, hook line and sinker. I’ve just bought my first 2 deals after trying out some of the freebies and I think I’m going to become a DC addict. Can’t wait to get time to download and try out my new goodies. So glad I found you! I’m not a pro designer but for less than £20 it’s daft not to have em. Thanks so much or the kind words. Simon. It makes me so happy to hear you’re loving our bundles so much, and I’m sure they’ll be of great help with your design work. Howdy all you beautiful folks @designcuts, and HOLY BATSHIT. I have never seen a deal like this before… So clap clap clap. How large is the file size? Is the file broken down into smaller bits? If I run out of space today, how long before I need to download everything? Is there an expiration date to the downloads? And one last thing, would LOVE brochure, flyer and such templates in your next bundle. pretty please. If I didn’t say this before, I will say HOLY BATSHIT, you guys are AMAZING! I can’t wait to visit New York City so I can get to the top of the Empire State Building and scream your names in gratitude. Seriously. Love you Design Cuts! You rock my world. [Now need to plan for more storage space]. Oh my, oh my. That’s a lot of questions. 🙂 Let me just email you about this, to get this all sorted and explained for you. Hi just trying to purchase this deal and I press buy and enter all my details etc for payment and then then the screen freezes? It has done this twice now. Please can you investigate thanks? Let me just email you about this, Lisa. It’s really weird. Sometimes banks just do spot checks even for transactions within the same country. It happened to me before, so I know how distressing this can be. I’m glad you got this all sorted out now though, and please don’t hesitate to email me, should you have any questions at all. This is simply a guilty pleasure deal! Had to grab it and I still haven’t tried the previous deals I’ve bought , hahah. You guys are too much (but in a very good way) You guys really know how to treat us community members really well! 😀 Thank you so much for the kind words, Stephanie. Glad to hear you fell in love with this bundle. I can certainly see why. It’s one of my favourites too. Enjoy playing with your new resources. Being from the USA I’m not up on this British expression “bespoke”. Used in the following “• 14 Bespoke retro illustrations in Illustrator AI format.” What is a bespoke illustration? Bespoke means custom made, so they’re not bulk designed illustrations you can get more or less anywhere. Awesome stuff Fran. 🙂 I hope you you’ll have lots of fun using your new resources. Please let me know if you need help with anything at all. oh dear…I didn’t see anything saying these wouldn’t work with PS elements except for the Roman Jusdado pkg. my elements doesn’t have smart objects…I have CS2 on another PC, but I’ve switched everything over to mac now. Is this the case for the other included packages? I don’t want to download them if I can’t use them. I’m so sorry about that. Unfortunately PSE tends to have a lot of limitations. This bundle relies heavily on smart objects, so it may not be 100% suitable for you. But not to worry I’ll email you about this, and we’ll get this all sorted for you. You’re very welcome Jenirose. 🙂 Enjoy your new design goodies. Amazing work and amazing deal! I have a question – can I use individual objects (pencils, clips, etc.) from the mock ups as items in my own mockup of greeting cards presentation? The mockup I am creating is for my shop’s use only and I could do with some great stationery items. Thank you! Thanks so much for the kind words Joanna, I’m glad hat you’re enjoying this bundle. I’d love to hear a little more about your plans for your bundle items. Part of our extended license does state that the original items can’t be extracted in their original format. Therefore if you used them as part of an original, wider, flattened design, such as a poster, or flattened graphic, that would be acceptable usage. However, if you offered them as part of your own scene creator or mockup template, that wouldn’t be ok, as it would be like reselling the actual bundle components directly. I hope that this makes sense, and if I’m here if you need anything clarifying further. I’ve just dropped you an email about this to help. Thank you Tom! Just emailed you back. I am not intending to sell mock ups, just greeting cards of my own design for which I need a decent presentation – there isn’t many greeting cards mock ups on the market ! I am combining my own photos with some of the items from your great bundle – it saves me a lot of time – big THANK YOU – for your amazing work. You’re so welcome Joanna! As I said in my emails, I love your work, and I think the mockups help to show off how beautiful it is. Keep it up :). HI. I don’t have Photoshop and live in England. If I buy this product, can I still use it in the UK? Hey Christina. Absolutely, you can use our products anywhere in the world :). It’s worth noting that many of the items in this bundle do require Photoshop though, due to things such as smart objects and filters. I’m seriously blown away that this is even for real. I haven’t been this excited in awhile. That’s such great feedback Crystal, we’re so happy that you’re enjoying your new bundle so much :). Please do let me know if we can help with ideas for how to use your new items. Does this mean that the fonts used in the showcase is not included? The fonts in the Super Strike pack pdf aren’t included in the download, as these are not created by Ian Barnard, the designer. However, they are all totally free, and Ian was kind enough to provide a handy guide for where to download them. I really hope that this helps, and that you’re enjoying working with your new bundle. Anyone else having trouble downloading Super Strike – unexpected end of file or something? That’s odd. I have however just updated the file, so perhaps you were downloading it, just as I changed the link. Would you mind trying to download it again? What Photoshop version is needed for The Glitz Shoppe? Hey y’all Great deal on the package. I am enjoying all the benefits of this package however, I’m having a hard time with the Charles Perrault folder…It seems that the PSD is not complete? (in the instruction it talks about adding your graphic in the Smart object…Which cannot be found). is this my mistake? could you please help? The smart object in the PSD is the one marked in red. If you just select that and drop your image into it, it should all work for you. I’ll also email you about this, in case you have any other questions. Tina, thanks for your response. i downloaded it again to make sure i hadn’t missed anything, i attached a screen shot from my computer to show my dilema. thanks for your insight. I’m not a creative professional (just a hobbyist), I don’t have a lot of cash to spare, and in all likelihood, I wouldn’t use, like, 90% of these resources. And even still, it’s taking every ounce of self-control I have to not buy this. This is an incredible-looking bundle. Wow. Woooow. 😀 Thank you Spencer for your kind words. Please don’t feel like you have to grab this bundle. I’m sure we’ll have one in the near future that suits you perfectly. 🙂 We only ever want our community members to use and really benefit from their new resources. Keep them coming…although you may need to start offering deals on storage solutions…my hard drive is getting pretty full. Thank you so much for your lovely feedback, Ingrid. I’m glad to hear you’re loving this bundle. Let me know if you’d like some tutorials for the bits of the bundle you’re unsure about, and I’ll be sure to email you some. I love it! It’s my first time here, and I’ve just purchased it right away! (lol) This will save me and my time—so, I sincerely thank you! Welcome to the community Marie. 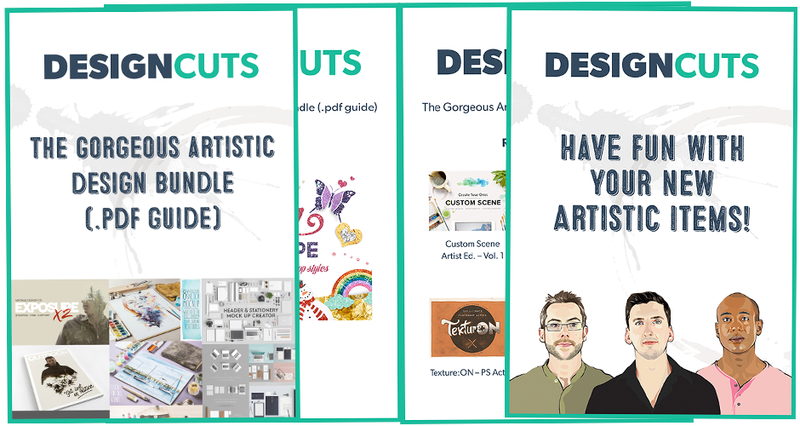 🙂 I’m so pleased to hear you’re enjoying your first Design Cuts bundle. How did you find us? I just purchased the bundle. This is a seriously great deal. I’m hoping it will save me a ton of time on some of my projects. Do the download links expire in my account at any time? no confirmation of payment or receipt? I have logged in to my account and nothing showing to download either? I just checked your account, and I can see the bundle in your account. It’s very likely that your original payment didn’t go through, which happens sometimes, simply because we’re based in the UK, and banks are rightly very cautious when it comes international transactions. Let me know if you’re having any other trouble with your purchase, and I’ll be here to help. Got here through a shoutout from GDB and wasn’t thinking too much when I clicked on “go see it for yourself” … so as I was scrolling away through the deal page I got to the part with the PS actions and my wife (who’s sitting next me) goes: hold it. Needless to say, within 60 seconds I bought the deal. I’m glad you and your wife are really liking this bundle. 🙂 I hope you both enjoy playing with your new resources. Oh wow, this looks ah-mazing! I want. What I wonder is how long before the downloads expire? I would like to split up the 13GB over two cycles of my wifi, since that represents a significant chunk of my monthly allotment. I turned to another computer and the purchase was fine. The problem is on my side so nevermind it. Great bundle this time. Congrats on sales! Awesome stuff. I was just about to email you with regards to your purchasing problem, but I’m glad to hear it all worked for you in the end. 🙂 Enjoy your new design goodies. What a great start for a new year! Thanks so much for your terrific deals!! You’re very welcome Susan, and thank you for your wonderful support. 🙂 I hope you’ll love using your new resources. Hi, great bundle and great deal as always. I’ve just purchased it. But I can’t seem to find the ’20 frame mock ups’ in the Mockup Zone folder. Can you please help me? I’m so sorry about that. The frames are actually in the Art Equipments Scene Generator V3 in the word file called Part 2 download. But not to worry, I’m just in the process of up[dating the bundle files. I’ve downloaded any part 2 downloads and such, and added them directly to the designer’s folder. We’ll make sure to announce the updates on the account page as soon as it’s completed. hey guys, thanks for the detailed preview. Will all this work on PSD and AI CS5? I had the browser window open. It showed Negative time on the deal but was allowing me to click thru and buy for $29. I refreshed page and it was gone. Anyway I can get in on the deal? Oh no, that’s so annoying, isn’t it. I’ve dropped you an email Hunter. Hi there! The textures look fantastic. I have Artboard on my mac, are these textures able to be used on this program? 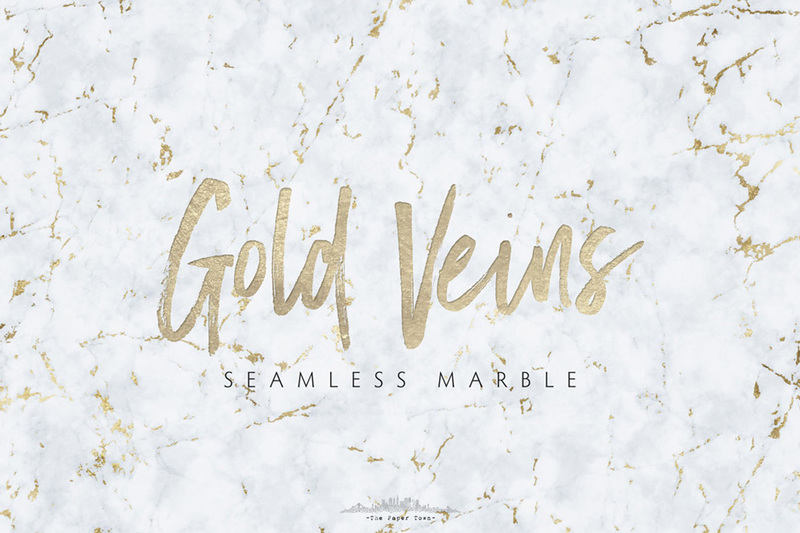 I’m a goldsmith by trade but can see a lot of use for some of these textures for some print type work. My instinct tells me that any jpeg textures should work in any kind of design software, however I’m not familiar with Artboard at all, so I don’t want to promise anything. If you really like the textures in this bundle, my suggestion is to grab the bundle, and test the textures you like in your program, If they work, fantastic, and if not, then please just email me, and I’ll be sure to refund your order. I just love bundles like this. It allows me to think outside of my box and consider all the new possibilities. I have been looking for a 2X Exposure to work with. Can’t wait to try it. Thanks so much for your kind feedback, Tristian. I’m really pleased to hear that this bundle is sparking your inspiration, and I hope you’ll have lots of fun with it. 2X Exposure is such a cool resource. I can’t wait to try it our myself. 🙂 I’d love to see some of your work actually, so please feel free to send us some of your designs. Great package, I have some and seen the others on CreativeMarket but one question…how does the updates work? These items do have updates (added items) from time to time. Thanks and keep up the great deals. Ha ha ha.. with everything is bundle offers I love the fact that your first comment from someone is “no fonts”..?!! I however on the other hand are as usual delighted with this collection. Well done chaps! I hadn’t even thought if it that way. I think it’s because we usually include a couple of fonts in our all inclusive bundles. But there will be more fonts in the future. I do think the bundle is a good deal I just have most of this stuff from other bundles or don’t find a need for it. I could always use some fonts. My wallet could use a break from all the great bundles DesignCuts carries anyways. Looks like an awesome deal… Question: are any of the pieces available for individual download? So much of this is new to me and I’d like to play around with one before buying the entire download. The price is awesome for the bundle, but I wonder if my computer can handle it and if I have the skills to make it happen. I am very familiar with Illustrator, but less knowledgeable with Ps. Do you have videos on how to use each piece? I’m afraid you can only purchase the whole bundle. There will be a small freebie pack to accompany one of our tutorials, but it won’t include examples of everything. I’d been waiting for the Glitter Shoppe and The Winter Collection for a really long time :D! Have no idea what to do with the templates or mockups though. I’m still astounded by this wizardry. For the longest time, I thought people actually printed name cards or framed their designs orz. Could I please, please, please request the tutorial you guys usually do for packs to include a guide on using templates effectively eg. how to make it look natural? Hope you guys are having a fantastic New Year :D! Yeah, I think it was actually you, who suggested Glitter Shoppe and The Winter Collection. 🙂 Tadah we secured it for you. I actually find the mockup objects and scene creators really versatile and useful, but feel free to drop me an email if you need any help with them. Some of the parts should definitely be compatible with Corel, but I also know that a big chunk is Photoshop specific. Let me email you about this, to make sure you can use everything ok. So thanks for this brilliant collection of things to spark some fresh ideas and start out my new year with tons of inspiration!! Enjoy playing with your new resources, and please feel free to send us some of your new designs. That is what I was repeating constantly going through this insanely awesome bundle! EVERYTHING in it I have wanted for a long time! Gold foils, glitter, and tons of awesome mock-ups that I so needed! You guys are awesome!! You truly really listen to us! Thank you, thank you, thank you!!!!! Like many here, I have multiple reactions when your emails arrive in my inbox. Delighted to see you, but with fingers hovering eagerly, an argument commences between my thought processes which seem to think that it may be best to delay the inevitable..I think I know what’s coming so I leave it for a day or two before opening.. but really..why am I worrying..mum bought me a 3TB Seagate for my birthday……then I just have to take a peek…scrolling through I am always enticed…..this time….there is GOLD! ..no contest…now if I can just gain some mastery over the technology then my next website is going to have a FANTASTIC header and appearance. I will be caving in as normal ..Happy New Year and thank you for these tremendous packages and all the work you put into creating them. Sorry about the constant temptation Marusja. But I’m with you on this, I love all the goldy, and sparkly stuff in this bundle. I was just about to tell you that the Helpful Documents was not the right one, I downloaded early and received documentation from the free Holiday bundle, decided to go back and download again, which is corrected now, maybe other early down-loaders should check to see if they have the right one! I was hoping that Mr. Vadim would have some contact information in his folder of his “Go Explore Nature” photo pack, but no luck. The reason I ask is, he states “300 ppi resolution .tiff files for printing purposes, could be obtained at not further cost, as well as original untouched version of the images” – I would love to take him up on the said offers, but have no way of contacting him for download, any help would be deeply appreciated! I’m so sorry Jerry. The mistake with the helpful documents is completely my fault. I’ve added the wrong folder to the download link. We’ve fixed that now though, so you can re-download the helpful documents. If you ever need to get in contact with any of the designers, you can always just drop us an email, and I’ll be sure to get them in touch with you. Have you contacted him yet via the link Katherine sent you, or do you still need help with this? I swear I have to stay away from this site because every time I visit I have to buy the deal!! I swear I was just thinking I needed some more mockup templates and BOOM, here they are! This one is awesome! Thank you, Thank you! Just Bought It…It’s Awesome…but i am having difficulty with using TextureON …can somebody help me with it. Sure no problem. Let me email you to get some details of what’s going on with Texture ON, and we’ll get that all sorted out for you. I’m also having a rough time with TextureOn. Help? Can you please clarify this for me: “The fonts must be used within a wider design though, and not comprise the entire design. This can include, but is not limited to posters, t-shirt designs, digital goods, merchandise etc…” What exactly does it mean? Fonts should be used in conjunction with other resources such as vectors, textures, patterns, or even other fonts. So it’s not really permitted to just print a word on a t-shirt for instance. Does that make sense? Shut up and give that great deal!!! Haha ok ok, you can have it. 😉 Glad you like the new resources, Yehuda. Is there a minimum Photoshop version requirement for the actions? If you have any of the relatively more recent versions of Photoshop you should be absolutely fine, but if you run into any trouble with the actions, you can just email us, and we’re here to help. If you’re really unhappy with your purchase though, again let us know, and I’d be more than happy to refund your order. I’d hate for you to be unhappy with one of your purchases. Hey DC Crew – thanks for another great bundle. They just never cease to amaze! Thank you very much Tom. 🙂 Glad you like it. I love shoes, but can live without buying yet another pair. I love chocolate, but can live without buying (or making) another bar. I love Design Cuts Deals but can…. cannot… seem to live without buying another bundle. Oh no, we didn’t mean to deprive you of chocolate. I’m glad to hear you’re liking the bundle though. 🙂 It really depends on what computer you’re using, although generally I find Samsung hard drives (internal and external) are really good. You can even get some that are compatible with both Mac and PC. BOOM! And just like that, Design Cuts begins its new year with a super-majestic firework-spray of a deal that leaves all other deal-negotiators squirming in the dust. (Yes, that immense cloud of dust that got left in the wake in all our collective rush to get our hands on these awesome babies). I’m really pleased you’re loving this new bundle, and I hope it’ll save you tons of time and stress. woaaahhwesooommee! 😛 been waiting for this kind of deal, thank you! What a way to start the year !!! Not sure i will have use for the mock ups but everything .. great bundle guys!! how can i get an old special that is over now? There is a font i want very badly and i dont see it offered anymore. help please. this is the file im looking for. 20.45 pm – Checking the price again… not bad, not bad (but my inner voice is shouting quite loudly IT IS THE JACKPOT! GETITGETITNOW!) Just calm down, I will NOT buy anything! 21.30 pm – Frank will understand, so I show him the deal… and clicking and talking and scroll down.. talking about it but then I realize his completely in another universe with his toys…. who cares… his not even six yet! 22.00 pm – I got it! Thank you so much for your lovely feedback. I’m really really pleased you’re loving this bundle. I have to admit there is a lot of amazing stuff in it, and it’s definitely one of my personal favourites. Another fabulous deal!! Thank you. Have you guys managed to get this into smaller multiple downloads yet – rather than one big one? We sure have. There are 17 downloads + 1 helpful documents download. There is however once file that is still 2.2GB large, simply because there is no way to really cut it down, without making it confusing. So let me know if you need a more stable link for that file, and I’ll be sure to get that to you. I was sure that my collection was mostly completed by now. So what you secure or you mind reader or something much more! Thanh you once more for putting on hell of a deal. Cya later will gett this but not right now still have to file all the rest i got form 2014. Thank you very much for your wonderful feedback Bernard. Let me know if you need any help with this bundle, if you grab it. It’s like you read my mind… or was it a survey? Enjoy your resources, and please do send us some of your work. I’d love to see how you use the goodies in this bundle. Sweet intro to 2015, loaded with some very useful items for any and all artistic nerds such as us. Catch you in a couple of weeks for the next deal! Thanks so much for the lovely comment Jerry. 🙂 I hope you’ll enjoy your new design goodies. Thank you! Love it all! That’s great to hear Laura, I’m so glad you’re enjoying all your new resources :). Wow, this might be my most favorite bundle in a while! What a deal! Thanks Eric, it’s definitely one of my favourites too. I hope you really enjoy it :). Oh man guys….I am at work and I am giggling with excitement!! You guys never cease to amaze me. I should just hand over my wallet now…. But really..I am not sure when I will use everything in this deal but how on earth can I pass this up?!?! Love you guys and can’t wait to see what the rest of 2015 has to offer us!!!!!!!!!!! Thanks so much Cyndi, your support honestly means the world to us :). I hope we didn’t get you in trouble for giggling too much at work ;). Please do let us know how you get on with your new items. They’re a lot of fun to work with! That was exactly my reaction when I organised these awesome resources :). Thanks Livia, we love you too :). Haha thanks Norbert. I’m afraid we’re planning to up the ante this year with our bundles, so hopefully the next 25 should be our best ever. We’ve invested in some great external hard-drives in the office recently, so please let me know if you need some recommendations :). I also do a lot of motion graphics/video work, so this particular model may be overkill for just Photoshop/Illustrator work but they do have many other models/options available. Just see this question (and asset management) come up a lot and maybe people don’t always get back to read all of the comments and responses so thought I’d throw it out there more time just in case it helps someone. Thanks guys so so much. This is fantastic. Really appreciate. You’re very welcome Joanna, I hope you love working with these new items. Unbelievable!!! :O – I love it! We couldn’t ask for a better reaction than that :D. Thanks Johannes, we hope you love using your new resources. WOW. This is so amazing, guys. Thank you SO much for all the wonderful packages, especially for the fantastic mock-up templates! You’re welcome Kathrine, thanks for the great feedback :). These mockup templates are the best I’ve come across, so it’s so awesome to see the DC community enjoying them so much. Love this set!! I didn’t even know I needed any of this until I saw it. Brilliant set of work. I feel guilty for getting such a great deal! How did I ever manage without you DesignCuts?! Thanks Michele, this has been a personal favourite of mine too, it was a pleasure to put together for you guys. Thanks so much for your loyalty and support, I hope you have a blast working with your new items. Me too. I not even have idea about it until I see it lol. Love theme. Hehe Glad to hear you’re liking our new bundle. Let me know if you need any help with your new resources. Guys , do you think words can express our gratitude ? It’s just amazing all you do for us , it is exactly what I needed , THANK YOU ! You’re so welcome Cristian :). That’s incredible feedback to hear, and we’re so glad that you’re enjoying your new bundle. Please do let us know what you create using your new items. 😀 Cross my heart. We’ll definitely have more fonts next time.